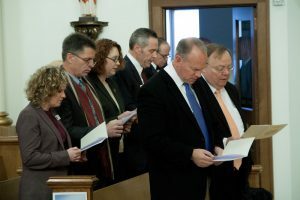 Governor Mead and other government leaders participate in Interfaith Prayer Service at St. Mary’s Cathedral. This morning, we celebrated what appears to be an historical event at St. Mary’s Cathedral in Cheyenne. The 2015 legislative session begins today in Wyoming, and for several years I have been wanting to bring together faith and government leaders to pray for the work of our legislators. Today, that dream came to life. We were blessed with a great representation of all three branches of government, including Governor Mead. Also making a strong showing were state-wide faith leaders from the majority of faith communities. Present were Rabbi Larry Moldo, from the Mt. Sinai congregation in Cheyenne; Dr. Mohamed Salih, Imam of the Southeast Wyoming Islamic Center of Cheyenne; Rev. Ernest Fitzhugh, Pastor of the Unity Missionary Baptist Church in Cheyenne; Rev. Rick Veit, Pastor of St. Mark’s Episcopal Church, Cheyenne; and Hank Bailey, Church of Jesus Christ of Latter Day Saints, Cheyenne. 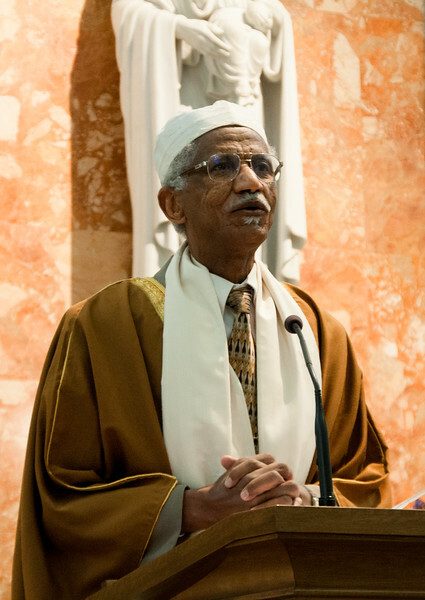 Dr. Salih proclaims a passage from the Koran during Interfaith Prayer Service at St. Mary’s Cathedral. The Holy Spirit was clearly at work this morning, breaking down barriers and opening doors to new relationships. The Prayer Service was simple. Two hymns were sung for opening and closing. 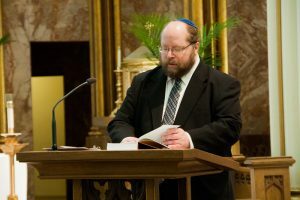 Three passages were proclaimed from God’s Word; Rabbi Moldo chanting a Psalm in Hebrew, Dr. Salih reading a passage from the Koran, a Catholic woman, Carey Hartmann reading a passage from St. James. I offered a brief reflection and several designated clergy of various faiths offered a prayer followed by a closing prayer and hymn. Below are my remarks during the prayer service. Please keep our government leaders in your prayers during this busy legislative season, and please continue to pray for greater unity among all of God’s people! Good morning! Again, thanks to all of you for joining us this morning, and thank all of you for your service to the people of this State, which is ultimately a service to God. The readings this morning recall that God is the Creator of all. Each of us and this beautiful State of Wyoming are a part of God’s creation. We are reminded as well that everything flows from the loving hand of God, a God of light and truth in Whom there is no change. We come together this morning to acknowledge the God and Father of all, and as we do so we realize this same God makes us more than neighbors; this One God makes us all brothers and sisters. So, we come together this morning to celebrate and strengthen our unity. The Scriptures tell us that all nations will praise the Lord (Psalm 72) and that Sovereignty over the earth and over every person is in the hand of God. (Book of Sirach 10:4) As a new legislative session begins, this simple truth can bring a proper perspective and wisdom to our work. Authority and governance are in our hands for a short time, but they have been placed there by God. We give thanks for this privilege and pray for the grace of bearing well the responsibility. We need wisdom to find our way in this world. It is wisdom that teaches respect for the dignity of the human person and the sanctity of every human life. Wisdom guides us to build relationships with one another, even with those with whom we disagree. It is wisdom that teaches us the language that breaks down barriers and builds bridges of justice, peace, and unity. It is wisdom that grants humility to learn from our mistakes and the courage to take up anew the task God has given us. It is wisdom that teaches us the language of God, the language of love here on earth so we will not be foreigners when we arrive in the fullness of God’s eternal Kingdom. Rabbi Moldo chants Psalm 72 during Interfaith Prayer Service at St. Mary’s Cathedral. Each of us is called to be holy and righteous in the sight of God. Striving for holiness and righteousness is not a part- time effort. It is fundamental to who we are as individuals created and called by God. It means we bring integrity and honesty to everything that we do. As God’s servants we are servants of the truth, and thus we do not seek to call bad good or darkness light. All of us present this morning are public servants, and thus, servants of God. At some point, each of us had to make a conscious decision about the form of our service, but ultimately, it is God who chose each of us, and we are chosen by God for God’s work. God is our helper; his mercies and kindness are ours through every age. We gather today to raise our voice from this earth to the God of every land and nation, to praise his name, and implore his wisdom and mercy upon us, that all we do may be for God’s greater glory and for service of the common good. May the blossoms upon the vine of this new legislative session bear good fruit that will serve well the people of Wyoming. May the members of this government lead us in the paths of righteousness, justice and truth. May God bless each of you, and may He bless the work of our hands. 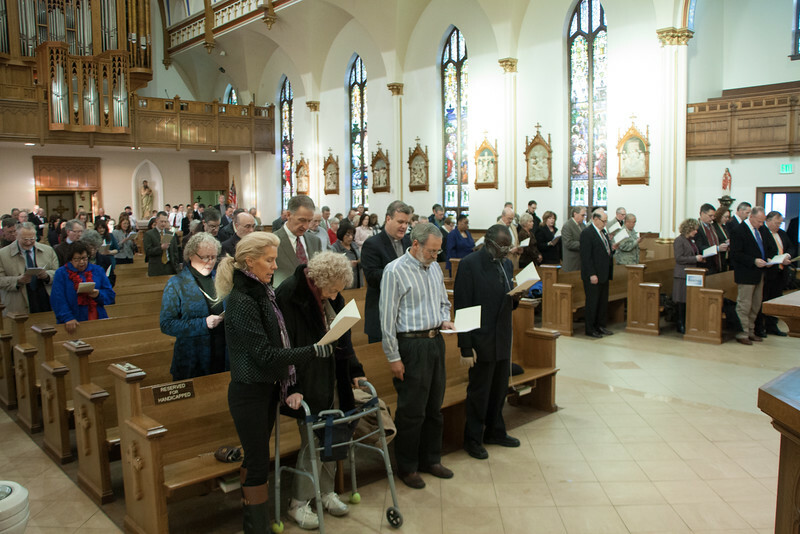 Faith and Government Leaders at Interfaith Prayer Service at St. Mary’s Cathedral.